Happy Groundhog Day! I don’t think any groundhogs in Connecticut are seeing shadows today – we are in the midst of yet another snowstorm! Regardless of what the groundhog sees, there is only a month and half left of winter…I am counting the days. recent trip, I decided to share some of his tipping advice. 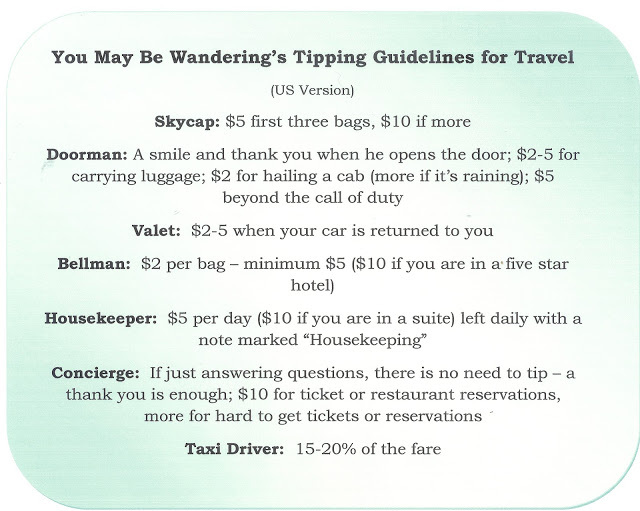 world check out CN Traveler’s Guide to Worldwide Tipping. where you are a regular (or hope to become one). bellman or other service staffperson. rules and check restaurant bills so you don’t double tip. thoughtful, and, remember, a smile and thank you also go a long way. 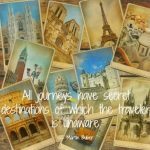 For fun, try this Travel Tipping Quiz, to see how your tipping skills measure up! Great post, Sandy. The Mister always handles the tipping, also, but when I travel alone, I just kind of wing it. Are you getting a lot of snow? We are. Counting the minutes until Spring. Great tips as usual, Sandy (oops – no pun intended, really!) Thanks for including that link to CN Traveler, that will come in handy. Excellent advise, I think this is going to be an incredible helpful post to many, one I will bookmark. Crazy weather once again, hope you are warm and staying inside the perfect day to do a whole lot of nothing! this was such a great post!! I will bookmark this for future reference! Tipping is one of those things that I want to do correctly but don't trust my own instincts as for as the amount to tip for different services. Thanks for this comprehensive list and for the added tips! I'm going to start packing some small envelopes for the housekeeping team's tips! One is never too old to learn or earn a few tips. Our youngest is off to Vienna next week with her Select Chorus Group and we are giving her all kinds of tips to take with her. She can hardly wait! I am creating a little book for her for the flight with all kinds of tips and in hopes that she will use it as a guide and journal. Gratitude and tipping go a long way! Excellent post! So many people never tip at all and this is an excellent reminder of who and what to tip. Hope you are staying warm and have dug out of the storm. Excellent advice and always worth reviewing!!! Thanks, as always, for guiding us in the travel department. Hope you are snuggled in by a fire. With all these school cancellations and delays, I am finding it hard to get things done!